Make a bold statement with the Kraus Kitchen Combo, feat. Geo Axis. The unique two-tone faucet has striking black insets that complement the colour of the sink. An EZGrip dual-function pull-out sprayhead provides flexible functionality. The KGU-413b 31" sink is made with 80% natural granite, for the look and feel of real stone. Choose from top mount or under mount installation for seamless style. A matching soap dispenser is included. Experience Kraus Quality, and create a kitchen you love. We've expanded our collection of best-selling sinks to include a contemporary commercial-style series of basins in a range of sizes. The Pax Zero-Radius 24-inch Laundry and Utility Sink has a clean, geometric design, with precise zero-radius corners for a distinctively modern look. This sink is handcrafted from premium T-304 stainless steel, an extra-tough & eco-friendly material that is highly valued for its sturdiness and durability. All Pax stainless steel sinks are amply padded on every side with our proprietary NoiseDefend sound dampening system. Protective undercoating is used to further reduce noise and prevent damaging condensation buildup in the base cabinet. This feature is an extension of the proven soundproofing technology seen in our best-selling basins, and offers superior noise reduction for a quieter home environment. Build a better home with the Pax Zero-Radius Series, and experience Kraus Quality with cutting-edge style. 31 Inch. 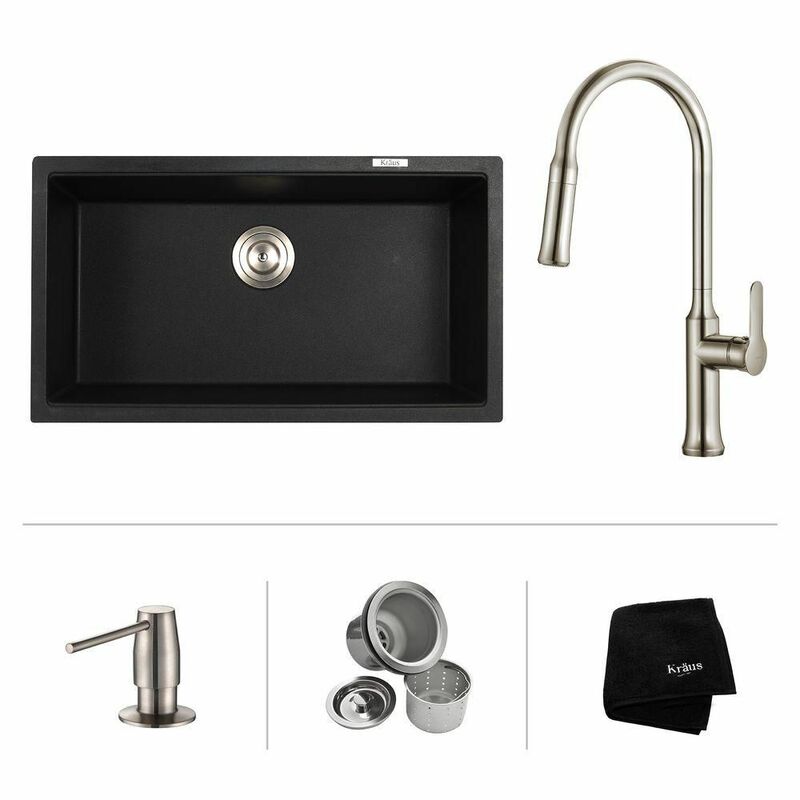 Undermount Single Bowl Sink W/ Pull Down Faucet & SD Stainless Steel Find your perfect pair with the Kitchen Combination, featuring one of our favourite faucets matched with a best-selling sink. The Nola Pull-Down Faucet features an ergonomic dual-function sprayhead and top-quality components for maximum durability. The KGU-413b 31" Undermount Single Bowl Sink is made from 80% natural granite, for a look that reflects the natural beauty of stone. This combo comes with a matching soap dispenser. Experience Kraus Quality, and outfit your kitchen in style. 31 Inch. Undermount Single Bowl Sink W/ Pull Down Faucet & SD Stainless Steel is rated 5.0 out of 5 by 2. Rated 5 out of 5 by Happyhope from Very satisfied. Made my kitchen beautiful...thanks!! Very satisfied. Made my kitchen beautiful...thanks!! Rated 5 out of 5 by Anonymous from Gorgeous! This sink is beautiful! Our only complaint is the top edge on the sides of the subject are plain (what we wanted for a seamless look), but the edges along the front and back of the sink are tiered in a way that cannot look seamless. Still very pleased with the sink and faucet. Compliments galore!